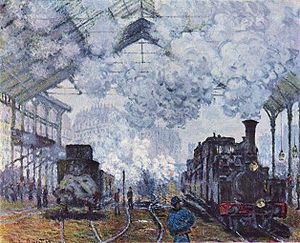 very hot steamy afternoon we’re at the train station – once again, – Gare Saint Lazare, and I’m waiting at the departure screen which is lit up in bright orange LCD lights for the VOIE to come up so I can race over there and get a good seat! We love the seats with the tables, but they are few and far between. Okay, so , I don’t know which one it is yet and I’m standing here very impatiently with almost 70 people behind me all staring at that screen and it’s getting very very warm!!! UG! – SO, when I see the magic number pop up (David guesses 23, I guess 21 – as we always make a game out of this, which the winner is the recipient of either 5 euros or a beer, ) THEN, and only then, I’ll race over there and grab our seats with a TABLE! While I’m waiting in this really hot huge train station, David is getting sandwiches. He knows that I need moutard on mine, because it’s so good and so hot that it opens my sinuses and ofcourse complements the whatever ingredients are sandwiched in there……..David is strictly plain,— plain, plain,plain – so he doesn’t know what he is missing!~ I’m having to wait at the head of the line for these seats like a maniac because we made this booking last minute, therefore, no seats could be assigned, as so many of our weekend trips are done this way because we just never know exactly if we’ll be able to go anywhere or not………..
Oh Oh ! The number, the magic number has appeared!! It’s 24!! And David has won the bet. I owe him a beer! This train station is very nice – beautiful – in places , and also – very ugly in other places – it’s been in the refurbishment stage for over 10 years now. NOTHING moves very fast in France. We are used to this now, and we’ve only been here 8 months. People who live here and are from here are not used to this, but we, being the lovers of France that we are have taken it all as “nor-mal-MAL” and accept it. That could be a good thing, since we can flow with the tide with the bureauracy. And there is a lot of that. So yeah, you might as well, just float along with it…………….I don’t need high blood pressure at my age. STAY TUNED FOR WHAT HAPPENS ONCE WE ARRIVE IN HONFLEUR!!!! Loved the artwork of the train stations! Felt I was back there again waiting for the train. LOL! Tom and I make games of little things like that. For instance, when at a Cardinal ballgame, we will guess if the ball will land on the pitchers mound or the grass after the last out of each inning. Or we will bet on length of time to get an order or get home from a trip. Looking forward to hearing about your mini-vaca.